Mix 200 g of mashed potatoes with the flour and lentils, shape by hand into 4 patties. Heat a dash of oil in a non-stick frying pan. Fry the patties for approx. 4 mins. on each side. Remove from the pan, place in a container for a take-away lunch. Heat a dash of oil in the same pan. Gently fry the chorizo until crispy, drain, place the chorizo and eggs in the container with the patties. 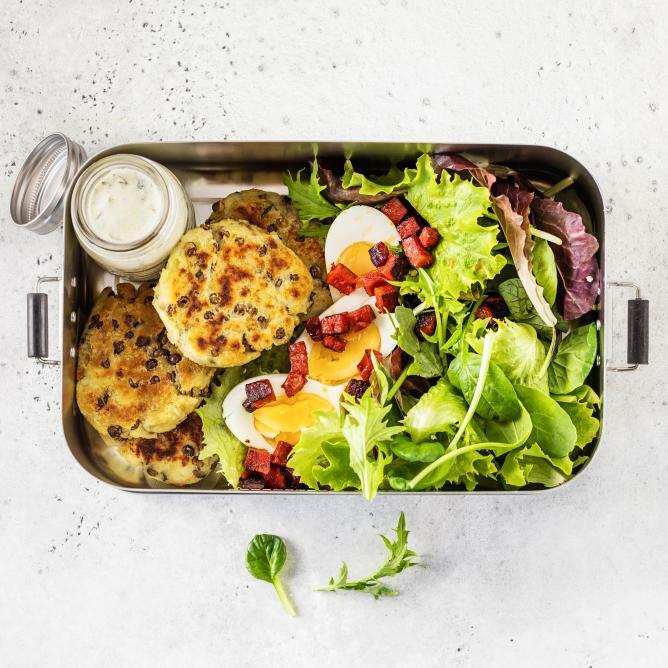 Add the salad, pour 2 tbsp of herb dressing into a small container, drizzle over the eggs and salad just before serving.